You have added Floral Embroidered Sharara Suit In Navy Blue Net/Georgette to your Shopping Bag! 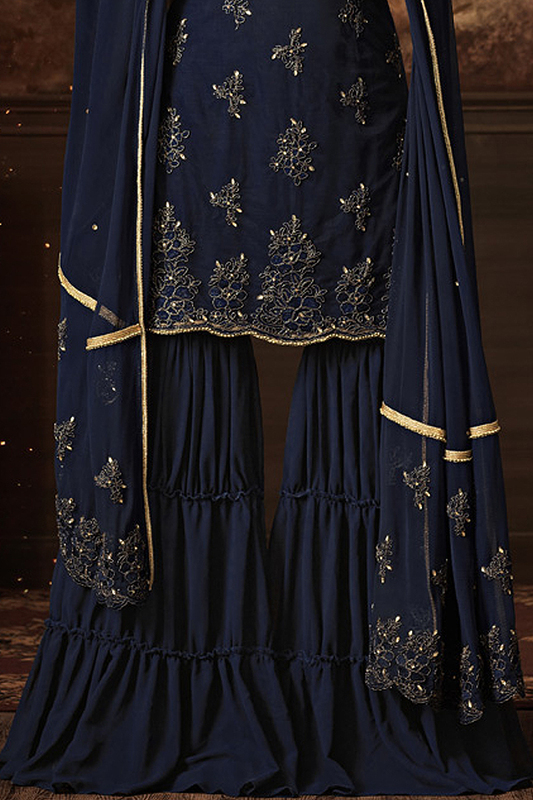 This navy blue Sharara suit embodies a new voice of tradition! The net kurti is embellished with thread embroidered floral motifs. It features sheer neckline with sweetheart bodice and beaded lace hem. The look gets complete with matching georgette sharara pants and a chiffon dupatta adorned with beautiful floral embroidery with stone work and sleek golden lace border. Get ready for any special occasion by accessorising your look with a traditional earrings and maang tika.